In today’s market there is no room for error. That’s why, at Balu India, we’re continuously trying to improve the quality. Incremental innovation is core to our policies & approach. ‘Balu’ has become a name symbolising quality & excellence in the field of crankshaft manufacturing since its inception in 1990. Our in-house capability & state of the art automotive engineering enables us to manufacture any type of crankshaft in a large range of applications namely Automotive, Agricultural, Marine & Industrial. 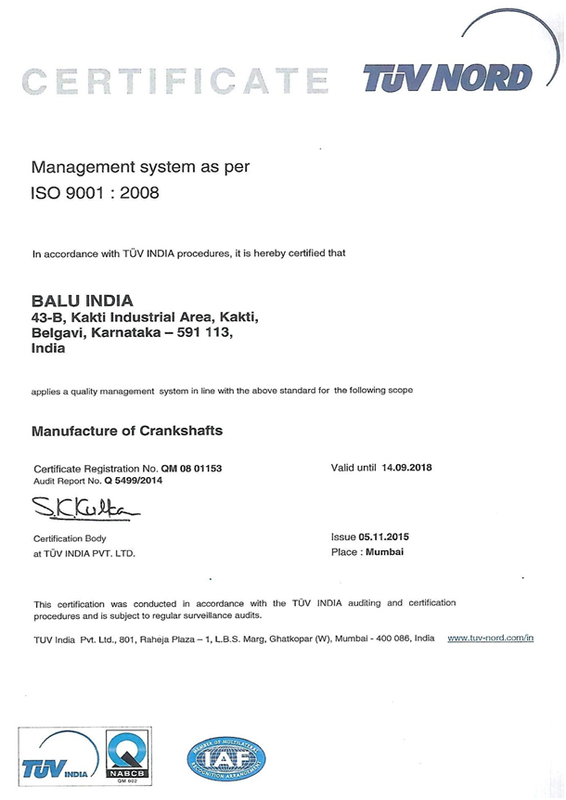 We have developed a very extensive range of forged crankshafts for leading Original Equipment Manufacturers within India and the rest of the world & a strong aftermarket presence in over 80 countries.The ISO/TS16949:2009 accreditation of our units in 2012 by TUV Nord Cert Gmbh added to our competitive edge making ‘Balu’ one of the very few companies to have this accreditation in the field of manufacturing crankshafts. Balu’ is now an avant-garde manufacturer of fully finished and semi-finished forged crankshafts and guarantee to manufacture as per customer requirements & market demands. 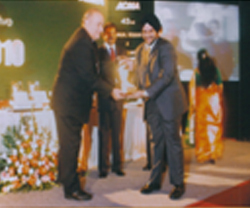 Our incremental innovation & continuous strive to improve has awarded us by making us the only company to have the capability to manufacture crankshafts conforming to EURO 3 / EURO 4 / Bharat IV Norms. 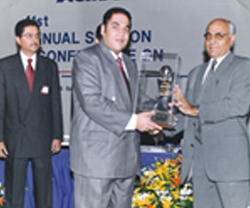 The manufacturing of the crankshafts is done with the latest equipments, instruments, technologies and highly skilled workforce which provide exceptional control over the entire process of manufacturing the crankshafts & strict adherence to Six Sigma & 8D disciplines.‘Balu’ is the supplier of choice of major OEM's not only in India but around the world due to our technological advantage and the highest standards of quality in the industry. 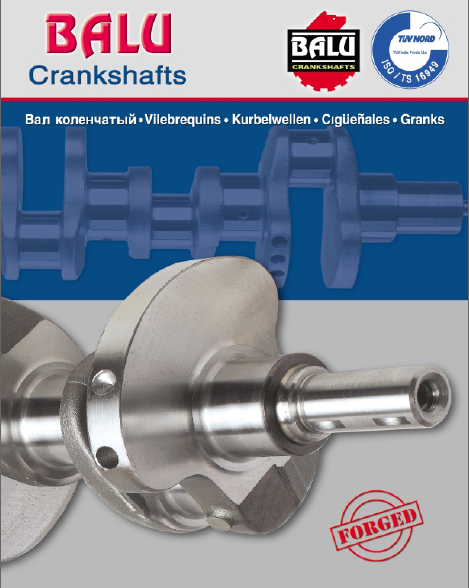 All the crankshafts are manufactured to exact O.E specifications and on CNC lines, to ensure precision at every stage. ‘Balu’ is a ISO/TS 16949:2009 accredited company & we are in the process of shortly acquiring a ISO/TS 14001 certification for our continuous efforts in environmental conservation. 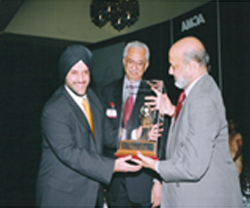 ‘Balu’ has been rewarded for its excellence in automotive engineering by the Automotive Component Manufacturing Association (ACMA) which is a GOVT of India Company. We have developed a very extensive range of forged crankshafts for leading Original Equipment Manufacturers within India and worldwide. The company has gained expertise in manufacturing of crankshafts for more than 25 years in respect to process of material selection, heat treatment, surface treatment etc. Quality, service and commitment is the primary objective of our company. We always strive to meet the expectations, specifications and needs of our customers. ‘BALU’, is now an avant-garde manufacturer of fully finished and semi-finished forged crankshafts. The machining of the crankshafts is done with the latest equipments, instruments, technologies. ‘Balu’ has incremental innovation as a fore-front of the R&D with constant commitment and interest in the application of the new technologies. 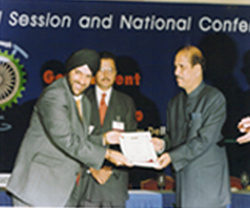 The company strives to be a leader in every aspect of its business. ‘Balu’ is committed to preserving & conservation of the environment as a step towards creation of a ‘green factory’ in harmony with the local area an important part of our environmental policy. Our 25 years of experience in the manufacturing of engine components, ‘Balu’ has strived to offer end to end solutions to its customers and with the present infrastructure capability & strong financial support.